Raspberry Pi robotics aces PiBorg are known for quality robots and add-ons, from the tiny PicoBorg board to the somewhat terrifying DoodleBorg. 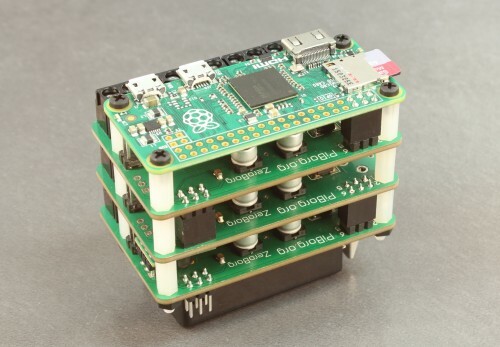 Now they’re bringing their magic to the Raspberry Pi Zero with ZeroBorg, a small but powerful motor controller and sensor board. We weren’t surprised to see their Kickstarter campaign hit its target quickly; there’s still time to jump on board. ZeroBorg costs from £15 and is barely larger than a Raspberry Pi Zero, and a Zero + ZeroBorg + 9V battery weigh as little as 65g, but it doesn’t pull its punches. You can control four motors independently, or more if you stack multiple ZeroBorgs over I2C (ideal for animatronics projects or CNC machine servos); I2C communication also means you can connect it to other add-on boards to pile on extra functionality, and there are two analogue inputs so you can connect any sensors that your project demands. It’s available with an infrared module, so you can control it via a TV remote, and a DCDC regulator for powering the Pi Zero. 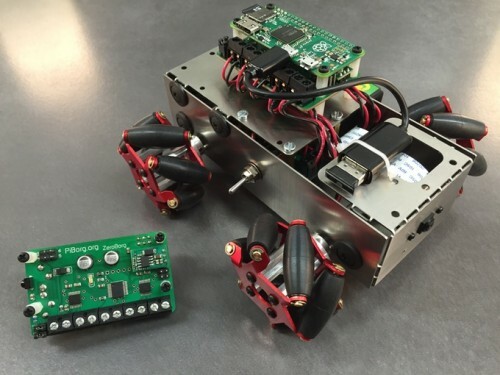 And, as with PiBorg’s other boards, they will provide open source software for controlling the board, so you can set up your robot exactly the way you choose. We love making boards and kits for the Raspberry Pi, mainly because the Pi community is like one big growing family. The support we’ve received so far with this Kickstarter has been phenomenal and we can’t thank the community and the Raspberry Pi Foundation enough. Many people are learning about programming, electronics and robotics with the Pi. Every day a new Pi project appears, and the community jumps in and helps develop ideas and solve problems. Already there are really awesome projects such as a Zero that makes tea in the morning, and a robot that feeds your cat while you are away. We can’t wait to see what people build with the ZeroBorg! Neither can we. Take a look! Can’t wait to get my paws on the ZeroBorg. The KS was a blast, they hit their goal in less than a day I think. Food for thought for those who think crowd funding and KS have peaked. When we will be able to buy pi zero from rs components/element 14 ? As Liz said on the forums a little while ago, while demand continues to be so phenomenally high, we’re sticking with our current four distributors (Pimoroni and The Pi Hut in the UK, and Adafruit and Micro Center in the US), although we may add more when demand is more manageable. As price it’s cheaper for me to buy an rpi A.
Quote:-Two of those resellers are in the UK (Pimoroni and The Pi Hut). Two are in the USA. (Adafruit and Micro Center.) All of them ship worldwide, apart from Micro Center who sell in physical stores. Unquote. Much to our regret, this seems not to be accurate. Not only the zero but ALL versions of the Raspberrypi are not shipped (by PiHut or Adafruit at least) to people in Belize, though the reasons for this have not been explained, and seem not to be due to non-availability. Perhaps you could ask Liz and let us know why and what can be done to remove such restrictions. Enquiries in the forums led to nothing to clear up such an unacceptable situation. Have you tried contacting the sellers directly? My thing is , that pimoroni sends only with courier , so the 10$ pi and cables will cost me 35$. And thepihut it doesn’t send to Greece. I dont know if adafruit sends here , and what the cost will be. But i can guess it will be a lot. Saw these at the Raspberry Pi Birthday party (which was fab! ), very cool, especially with a zero. Wow, there is no keeping up with what is available for the Raspberry Pi these days. That stacking connector for 3V3, GND, 5V0 and the I2C bus is very elegant. I’m always amazed by the hardware builders. Clever wheels. I like ’em.